You’ve had great fun with your boat, but the time has come to move on to a boat that is (choose one): larger, faster, shinier, newer. She’s been your best friend but you’ve got “boat fever” and, if you’re like most boat owners, you’ll trade up on a regular basis. All those new boats at the boat shows caught your eye, but before a new boat arrives in your slip, you’ll have to sell the old one. 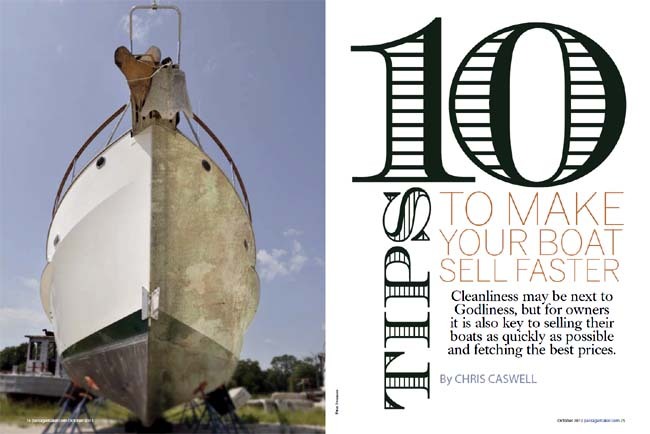 Here are 10 tips to make your boat a fast seller. It’s a natural human trait: We draw conclusions based on visual evidence. When a potential buyer walks up to your boat and sees ratty docklines, it’s clear that you don’t take care of essentials. When the buyer looks into the bilge and sees rusty brown water, you obviously aren’t a good boat keeper. If he pulls an engine dipstick and sees dirty black gunk, well, what would you think about the engine condition? I know when I see a boat that’s a floating ghetto, Two things come to mind. First, I automatically assume that maintenance is equally shoddy on all the systems. Second, I immediately think about making a low-ball offer. On the outside, now is the time to wax the hull, polish the metal to a gleam and add a coat of fresh varnish. Teak decks shouldn’t be gray, and nonskid surfaces shouldn’t have stains, either. 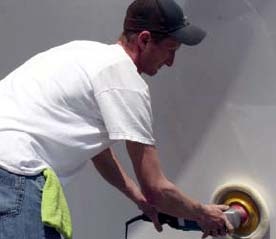 A small investment in maintenance can earn you thousands in resale value. Inside, give your boat a good spring cleaning. If you have carpet, a shampoo will remove the dirt and stains that you don’t even notice anymore. Curtains and upholstery need cleaning, too, especially if you have pets or smokers aboard. In the galley, it’s particularly important to clean the stove and oven to get rid of spills and crumbs from last season, because many women look at the stove to see how well the boat is maintained. Empty out the refrigerator, clean it thoroughly, and leave an open box of baking soda inside to remove the odor of that onion you forgot months ago. Wipe down all cabinets and bulkheads using a household cleaner, and I guarantee you’ll be shocked by the color of the cloth afterward. Tip: Leave sheets of scented fabric softener in drawers and lockers so they have the fragrance of fresh laundry when a buyer opens them. When you’re cleaning, don’t just think about the broad strokes, such as the hull or deck. Get down to the details, too. Nothing makes a worse that’s a sticky-icky blackish color. And, yes—cleaning means the bilge, too. If it’s really grim, call in some professionals who can steam or pressure wash it back to pristine. 2. Make Her Smell Good. Clean is just a start, because your boat has to smell clean and fresh, too. How many times have you stepped below into a funky aroma that combines oil, mildew, dirty bilge and nasty head into a scent that is guaranteed to kill a sale? 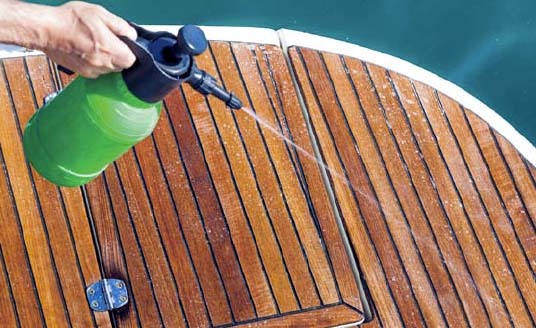 Cleaning your boat thoroughly is a good start, but pay particular attention to the head, where it needs to look and smell like the day the boat launched. Empty the holding tank, and add chemicals to neutralize any aroma. Make sure you leave ports or hatches open to air the boat thoroughly. Think about how inviting it feels when you’re looking at boats in a boat show, and make yours the same. The old joke is that a boat is a hole in the water, but the truth is that we throw junk, not money, into it. If you were to open every locker today, you’d be astounded at the useless stuff you have aboard: Empty WD-40 cans, bent shackles, gaskets that fit nothing, all the stuff that needed to be tossed but instead took up permanent residence. Why do we fill galley drawers with stray corks? No one ever loses corks. Archaeologists would have a field day aboard any modern yacht. Empty lockers look much larger, and you’ll find that many of the odors you’ve been fighting emanate from the grungy stuff within. Clean the lockers, and the aroma goes, too. When you get them emptied, throw a coat of white paint in there, too. You want your buyer to think you have immense amounts of stowage space because, as you know, there is never enough. Take all your personal gear off the boat, because you want potential buyers to start thinking about your boat as their boat. Personal photographs: Gone. Lipstick and shaving cream in the head: Gone. Not only will this get rid of personal attachments, but it will also make the boat seem quite a bit larger. Don’t forget the hanging lockers while you’re getting your gear off. A locker full of someone else’s aromatic foul-weather jackets or boots isn’t conducive to a sale. This is also the time to remove anything that doesn’t go with the sale. Too many million-dollar sales have been queered at the eleventh hour by the question of who gets the $100 barometer. Don’t pillage the boat, but take anything with a personal sentiment and leave the rest. Tip: Take the toaster and blender from the galley. They date the boat, make the counters look crowded and are probably dirty, too. I’ve always found it amusing that the only time everything works perfectly on my boats is when I put them up for sale. No boat larger than a dinghy sells without a survey these days, so it’s better to fix things before that point. Now is the time to cure that erratic windshield wiper, because Murphy’s Law says a buyer is going to flip that one particular switch. Sure, you lived with it, but the buyer only sees an example of poor maintenance. Make sure the fire extinguishers are current, the life jackets legal, and the flares within their expiration dates. When it comes to the canvas on board, if yours is worn or tired, you have three choices: Remove it, repair it or replace it. To cut your replacement costs, remove anything that isn’t necessary to the sale. A bimini top is expected, so either repair the frozen snaps or, if the top is marginal, replace it. I shouldn’t have to say this, but make sure the engines start promptly. Many sales have been lost because a battery was drained and the engine wouldn’t fire. Tune the engines and charge the batteries, because you want to impress the buyer with engines that fire instantly. Speaking of engines, now is the time to think about having your engine steamed to get rid of all the oil. The downside is that this will show the bare spots that rust. You’ll want to wire-brush them and touch them up with marine engine enamel. Don’t—ever—just paint over everything. That’s a red flag for buyers and surveyors alike. They’ll both assume you’re hiding something. When it comes to existing electronics, you’re probably best leaving them, rather than trying to upgrade them. Everyone has different tastes in brands and types, so if your electronics are old or tired, you might want to make it clear that you’re giving the buyers a rebate of X-thousand dollars for new electronics of their choice. That’s turning a negative into a positive, and the buyers will start dreaming about all the new black boxes they can buy—for your former boat. If you had the engines or gear rebuilt professionally, get the receipts and make them available. You need to prove that your engines or generator have a certain number of hours, or that the air conditioning was rebuilt on this date. Again, this is reassuring to the buyer. Sure, a boat can sell on its own, but, with a little work, you can add immensely to the sale price. Some of the smartest buyers I’ve seen have assembled a notebook providing all the details of the boat’s history: upgrades, inventory, systems. Some have included tear sheets from positive magazine reviews of their make and model of boat; others have listed voyages taken. This is, plain and simple, a selling tool. Tip: You might include some ads for similar boats—that are more expensive, of course! It goes without saying. The same thing applies to photography. I’m always astounded, in this age of digital cameras, that so many brokerage photos look like they were shot with a Polaroid from the ’60s. Get good, well-lit photos of every area of your boat, from saloon, to cabins, to heads. This means the engine room, cockpit, foredeck and, if there is one, the flybridge. Get detailed shots of the electrical panel and electronics, and don’t forget the tender, too. There are many who say that having a survey performed before you sell your boat is an unnecessary expense, but I think it’s worth every penny. First, there’s eventually going to be a survey, because your buyer is smart and, besides, it’s required for insurance and financing. More important, though, is that it gives you a chance to fix for a few dollars things that might take thousands off the selling price. You’ll get a preview of what the buyer’s surveyor is going to find wrong, and you can make those things right. Now is not the time to stint on fixing things found on the survey. Sure, it may cost you $100 to fix the compass light, but the buyer’s surveyor may suggest taking off a thousand dollars because the compass might be bad, too. It’s better to cure it now, on your terms. Most people don’t realize it, but there are, of course, three prices: the seller’s price, the buyer’s price and the fair market value. Your starting point should be the market value, because owners invariably overvalue their boats. See what similar boats with similar equipment are selling for, and then price yours aggressively. You don’t want to be on the market for months—you want to be on your new, or new to you, boat. You can’t do anything about the buyer’s idea of the price, but if he or she makes an offer fairly close to what you’re asking, grab the money and run. You can make up any difference when you buy your next boat. Experienced yacht brokers shake their heads with tales of clients who held out for a few bucks more and lost a sale, only to have their boats languish for months longer on the market. No, you shouldn’t take a bath on your boat, but don’t be penny-foolish. 9. Set Up Some Props. Once you’ve checked items 1 through 8 off your list, imagine your boat as a stage and add props to make it convincing. Don’t go overboard, but a few items can make all the difference. For example, the dining table should be set for a nice dinner— place mats, dishes, wine glasses. If you’re leaving your plates aboard, so much the better. Have you ever seen a brochure for a new boat that didn’t have the dining table decorated invitingly? The same goes for the staterooms. Don’t leave the mattresses bare: a cheerful and inexpensive comforter with a couple of matching pillows can turn a prison cell into an inviting getaway. In the head, hang one towel on the bar, or it will look too stark. Don’t go overboard with vases and decor: that’s what you removed to make the boat look large. Perhaps a book or two on a shelf, a magazine on the coffee table. Lived in but not overloaded is the goal. This is a boat you’ve enjoyed, and now it’s time for her to go to a new owner. This shouldn’t feel like arm wrestling Arnold Schwarzenegger. It should be a good time, when you can start thinking seriously about your next boat. Saying goodbye to an old friend is always tough, but that’s offset by getting top dollar that you can put toward a new dream boat. Remember: There is someone out there who wants your boat. After all, you did, didn’t you?